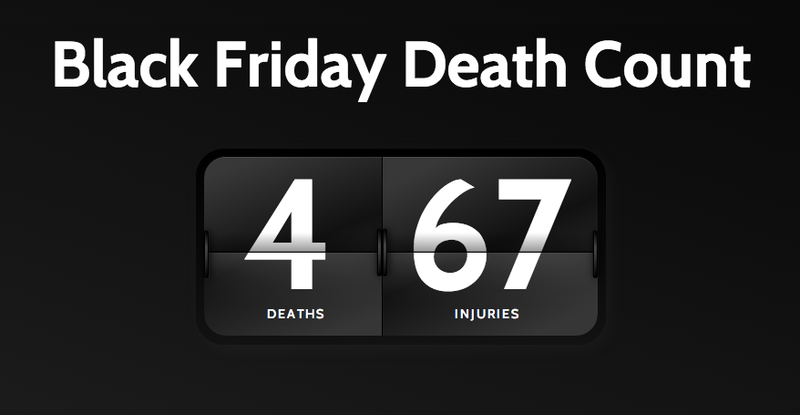 Black Friday death count as of Thanksgiving 2013. I had never been to a Black Friday shopping spree before. The thought of camping out for hours in the chilling pre‐​dawn night always seemed perverse to me… but that was before I started browsing the Black Friday ads and listening to stories of stunning deals and bargains. I thought I had conquered technolust a long time ago. In high school I was often caught up in buying the latest gadget or computer upgrade. A fascination with the cutting edge of technology later compelled me to major in electrical engineering, but by the time I graduated from Princeton I had become jaded with technology. The whole industry seemed perverse: laboring over a piece of silicon whose sole function was to glue children to computer screens; developing incredible technologies that were only available to the richest of the rich; seeing this year’s hottest items become next year’s trash. As much as I admired the creative and hard‐​working spirit of modern engineers, I couldn’t bring myself to love the things they made anymore. At least, not enough to buy thousands of dollars worth of stuff. My brother and I were perched over a computer monitor, poring through rumored Black Friday discounts. Like a commercial advertisement, images of iPads and DVDs danced in my mind to the background music of self‐​justification. How could it be considered greed to buy a discounted gift for a loved one? Wouldn’t it be perfect to be able to give great gifts for only half the price? Wasn’t that being responsible and economic with my finances: an example of good stewardship? I began constructing an appealing image of the next morning’s escapade: camping out on the sidewalk with a thermos of hot chocolate while listening to medical school lectures and greeting fellow shoppers with holiday cheer. The thought of studying for exams, finishing my Christmas shopping, building character, and dispensing goodwill towards all men (all at the same time) was becoming very attractive. Then I opened my e‐​mail inbox and read a message from a friend at school. We were taking the same public health class and our professor, Dr. Mark Robson, was featured in the Star Ledger’s front page article. Normally I would have been very happy to see Dr. Robson featured in the newspaper. He is a jovial man who enjoys making fun of his weight, age, and students. He’s the sort of professor I trusted to care about my person as well as my education. Unfortunately, the newspaper article was about Professor Robson’s younger brother, who had died suddenly and unexpectedly a few months prior. While reading the article, I remembered how stunned the class was to hear the news. Despite the loss, Prof. Robson was back teaching only a week after the death. He briefly told us about the tragedy and did his best to get through the three‐​hour lecture. The first hour was characterized by the same style we had come to enjoy from him: well‐​paced and filled with jokes, theory, and trivia. But the second hour addressed agriculture and farming—elements that surely reminded him of his brother —and his voice suddenly faltered and lost its confidence. He became monotone and listless until the end of class. Text and instant messaging, blogging, peer‐​to‐​peer networking, Blackberries, Facebook, and a bevy of other novelties have revolutionized the ways in which we can save clock time and communicate efficiently, but they have not given us something meaningful to communicate about. Though we are able to do more, the question becomes, “Are we doing anything worthwhile?” We once perceived the delay between thought and action to be a waste, but perhaps its loss has caused us to lose the meaning behind the things we do. Instead of giving thanks at Thanksgiving, we go out and buy more junk. Instead of rediscovering treasure at Christmastime, we find ourselves in more debt. Instead of composing a letter or crafting an article, we instant message and blog. Instead of finding entertainment and joy in simple diversions, we compulsively check e‐​mail, Facebook, and YouTube. We have lost the dual senses of anticipation and delight in the moment: the waiting, meditating, and “wasting of time” that once made the product of our furious efforts something worthwhile. We have become impatient, unfulfilled, and perpetually fixated on the future. We have filled our lives with so much hardware and noise that it makes us wonder if we too will waste away into a dull obsolescence. I write this article in the bowels of a medical school study room and must confess that the whole concept of patience seems incredibly difficult. There are times when I just want to leave this place and be done with it all: the late, caffeinated nights; the pressure of exams and the stress to achieve; the quiet and dim study halls that evoke sentiments of frustration and anxiety. I want to move on and be somewhere else and do something different. I want to be out of school; I want to earn a living; I want to serve the poor; I want to have a family; I want to procrastinate; I want everything and to be anywhere and do anything else except the where and the how and the what of the now. But the call of Christ is for me to enter into a divine moment and understand that I have been placed here – in this discrete unit of time – for a purpose. Looking back, I must also admit that there have been times even in this school when I have laughed and enjoyed the company of other students; when I have stared at my notes in amazement at the complexity and intricacy of life; and when I have realized that I am precisely where God wants me to be. The very next moment may bring a phone call or an e‐​mail from a friend that brings with it a conversation of joy or sorrow. The next moment may simply be a continuation of this moment’s reflection. Regardless, I am learning to trust that there is a time for everything and that this moment holds its own special and sacred purpose in the narrative of God’s divine history.